Author Written by Ibn e Rasheed and last updated on Posted on January 16, 2018 . SAP Customer Master Data and Master Data Management is of core importance in SAP. A transaction’s accuracy is based on correct and accurate Master Data. 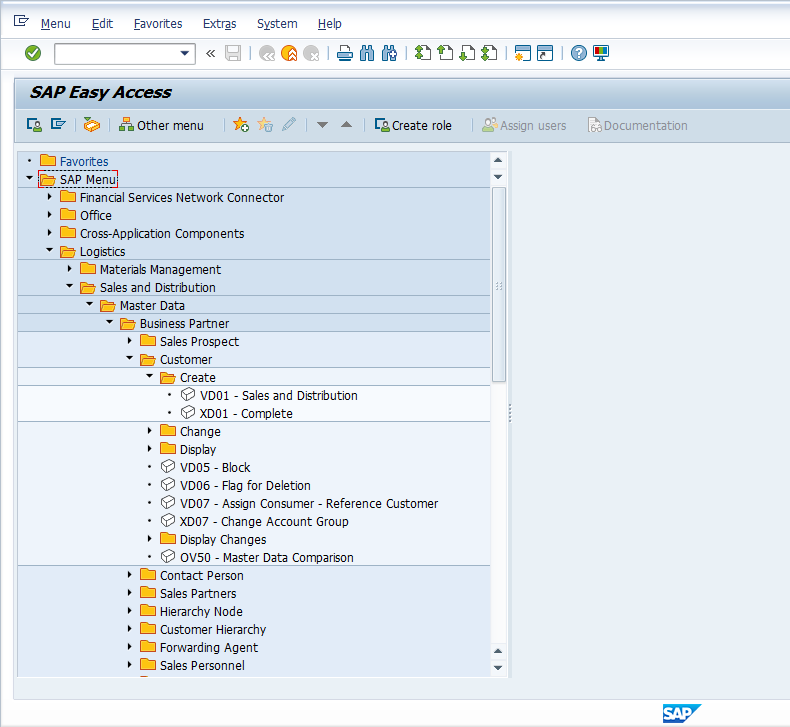 If the Master Data is not maintained in the SAP system, transactions cannot be performed. If the Master Data is not properly and accurate maintained, process like either Procure-to-Pay or Order-to-Cash, Record-to-Report, Hire-to-Retire, Plan-to-Produce will not be processed accurately. If same are not processed accurately, accurate reporting cannot be obtained by any means. The importance of Master Data can be understood by this example that many companies have experienced and dedicated Master Data Management resources in their Master Data Management team meaning, there are set of employees who are dedicated and solely look after Master Data they are usually called the Master Data Management (MDM) team. They carefully consider the Master Data, responsible for entering accurate data in prescribed fields. They also closely observe, look vigilantly and check thoroughly if there’s any repetition, duplication and redundancy of the Master Data. Master data contains information that is always used in the same way. Master data forms the basis of sales and distribution processing. Data about the products as well as about the business partners (customers) are the basis for sales processing. 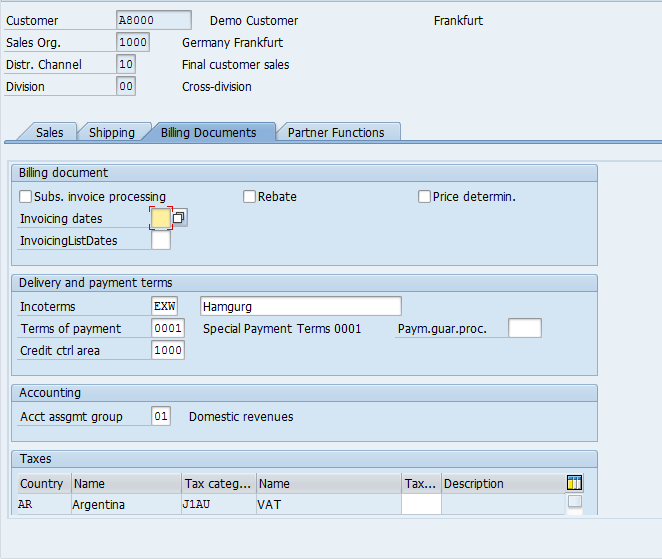 Sales processing with the SAP ECC system requires that the master data is maintained in the system. 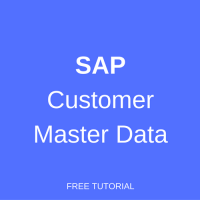 SAP Customer Master Data would include all the details regarding the customers which are to be maintained into the system and used as and when required. 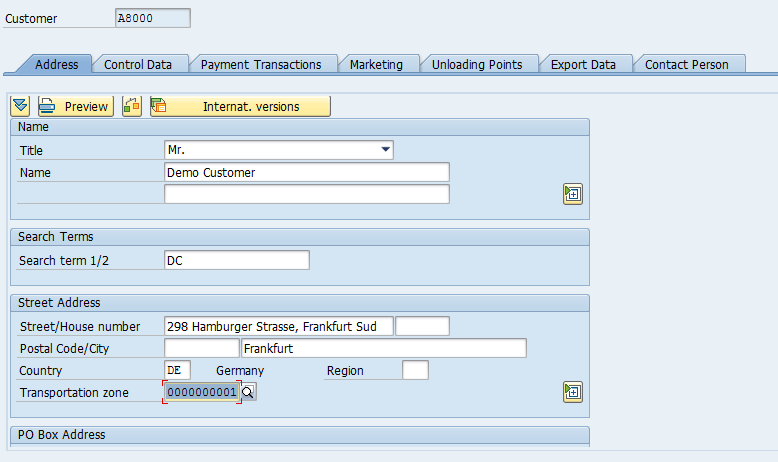 SAP Customer Master Data, as can be seen from its name, is the Master Data related to Customer information. In SAP, if you wish to sale finished goods, services or even scrap, you need a Customer so that the sales can be recorded and executed. Let’s have a brief look on both types of Customers. Sales & Distribution Customer is one whom you sell your manufactured or trading goods and services meaning the products which belong to your organization and for which you are known at the market. This type of Customer can also be used for the selling scrap materials, which is a regular feature in the organization, when you want to record and track the actual quantity of the scrap sold, if it has a significant accounting and financial impact. Finance or FI Customer is one where you want to record sales to those customers who are not regular ones, not part of your regular sales and you do not offer your regular manufactured / trading goods and services to them. The example of such type of customers can be, but not limited to, customers to whom you sell your fixed assets after they were completely depreciated. Like you have a machinery which has reached the end of its technical life and now you want to scrap it. Similarly, some companies offer vehicles for sale which the company has been using for quite some time to their employees first before offering it for sale at the open market. In short, those customers who are not part of regular sales and for whom there is no requirement to maintain Sales & Distribution’s specific data. Account Groups in Customer Master Data are used for high level classification of Customers. It helps you to classify your Customers based on different traits, sector or line of business. It also helps to decide which fields are mandatory when you are creating a customer related to a certain sector, which fields are optional and which fields can be suppressed or made hidden so that the User at the time of Customer creation doesn’t get confused. 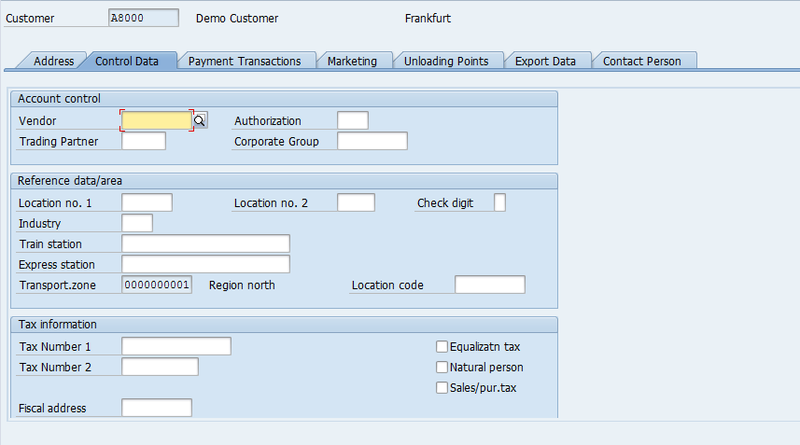 Example: You can make Value Added Tax – VAT field mandatory in the Account Group of a regular customer, so that the system doesn’t let the User to bypass the said field until and unless it is populated. 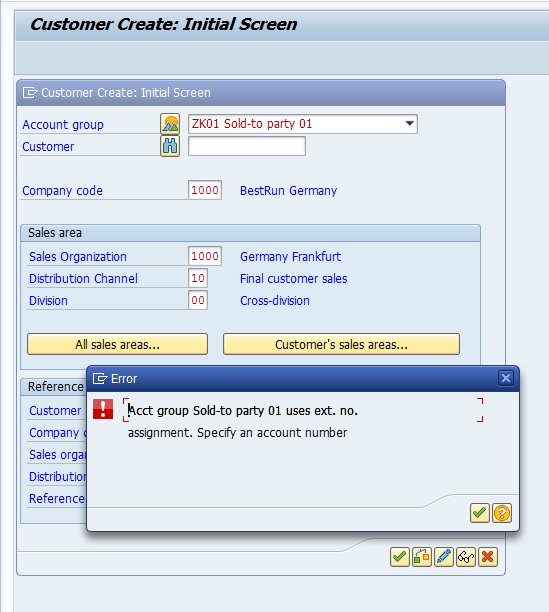 Under Account Groups you can configure in the backend and define if a certain Account Group’s Customer number can be assigned internally / automatically by the SAP system or externally by the User at the time of Customer creation or specific number range for a specific customer or whether the Customer’s Account Group number range is either numeric or alphanumeric. 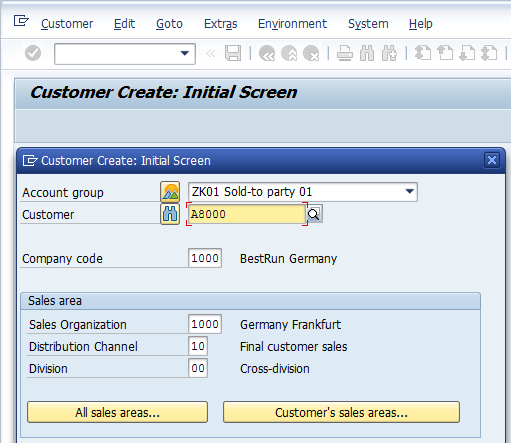 General Data in the Customer Master that is relevant for both Sales & Distribution and Accounting, the data fields are grouped on several tab pages. The general data includes Name, Address, Telephone number, other contact details, VAT, Tax, Good Receiving Hours of Customer, Market Standing of the Customer, Correspondence, Contact Persons with their designation and contract detail, etc. Company Code Data is relevant for Financial Accounting purposes and processes. It is specific for a given Company Code. This view records data of the Customer’s Accounting Data such as reconciliation account, sort rule, payment terms, withholding tax information, payment methods, correspondence information with the customer, dunning, insurance, etc. If you edit a master record, you must specify the customer number and a company code to access the screens containing company code data. You can only invoice a business transaction if the data on the Payer partner function is entered in the Financial Accounting view. 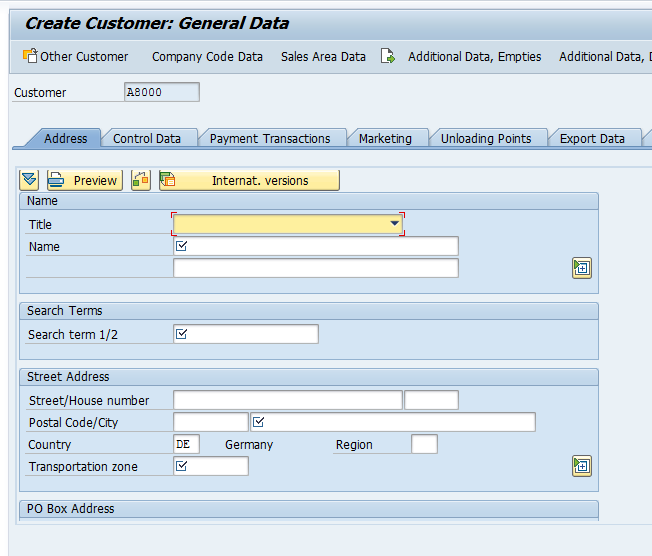 Sales Area Data is relevant for Sales and Distribution processes and is specific to a given Sales Area. You can maintain the Sales Area Data in various ways, depending on the Sales Area (a combination of Sales organization, Distribution channel and Division). All the sales related information will be maintained in this area. 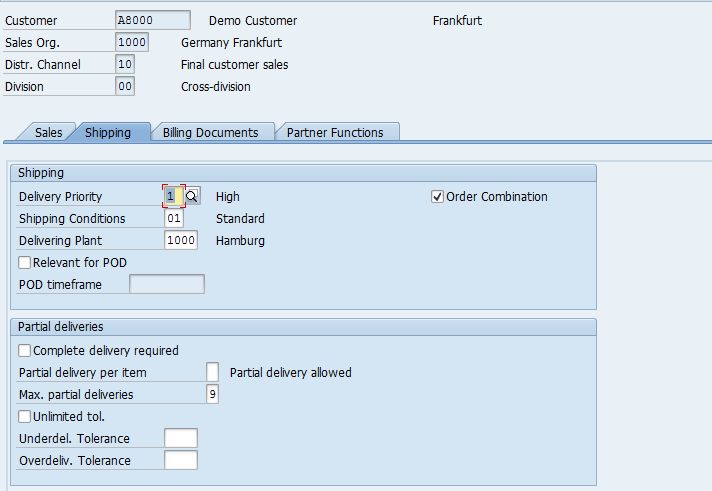 Including Sales, Shipping, Billing and Partner Function. All the data present in the system will be applicable only for that specific sales area. The customer can be extended for any other sales area as well depending upon business requirements. This view is to record the data of customer related to Sales and Distribution transaction such as data for sales process, delivery process, billing process and partner function. The data for one customer can differ for each sales area. This data is only relevant to Sales and Distribution. If you edit a Customer Master record, you must enter the Customer number and the Sales Area to access screens containing Sales and Distribution data. You can only process Sales and Distribution transactions, for example, a sales order, after entering the Sales and Distribution data for a Customer in the Customer Master Data. 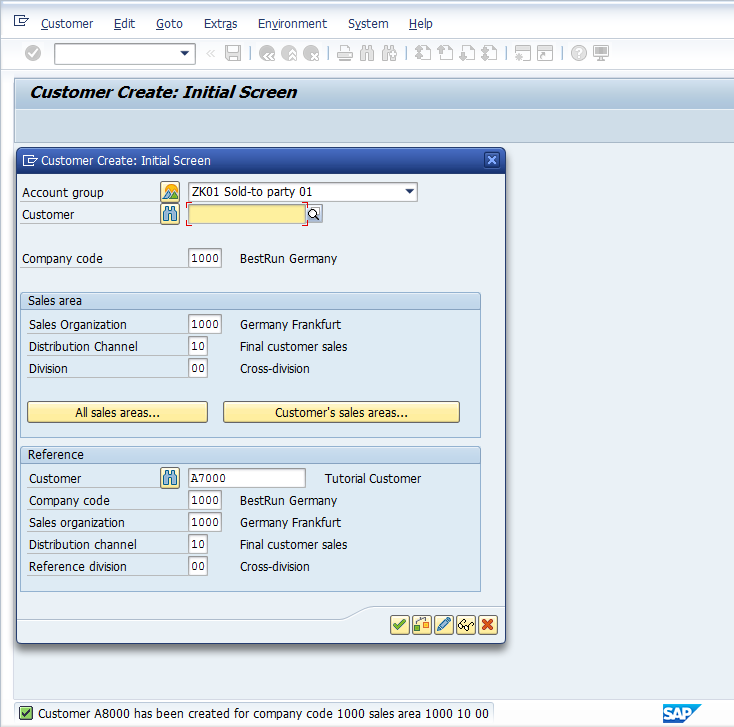 Whenever you want to create Customer Master Data, enter XD01 to create Customer Master complete / centrally. 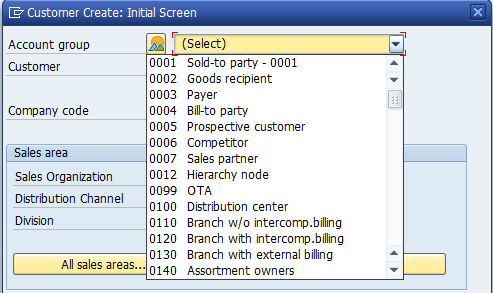 Select the relevant Account Group and populate relevant Company Code, Sales Organization, Distribution Channel and Division. Since this Account Group has a setting of ‘external’ number range which is alphanumeric, therefore, enter the Customer code as well. Else in other case where number range is internal this field needs to be blank. If you want to reference the Customer which is already created in the system and is very close to the nature of the Master Data you are about to create, you can use the second section ‘Reference’ of the dialog box on the initial screen. This step will help and assist you in populating required fields as they will be copied from the reference Customer, except the basic information i.e. name, phone, etc. which will help in easing the data entry. You can change the default populated fields, where required. 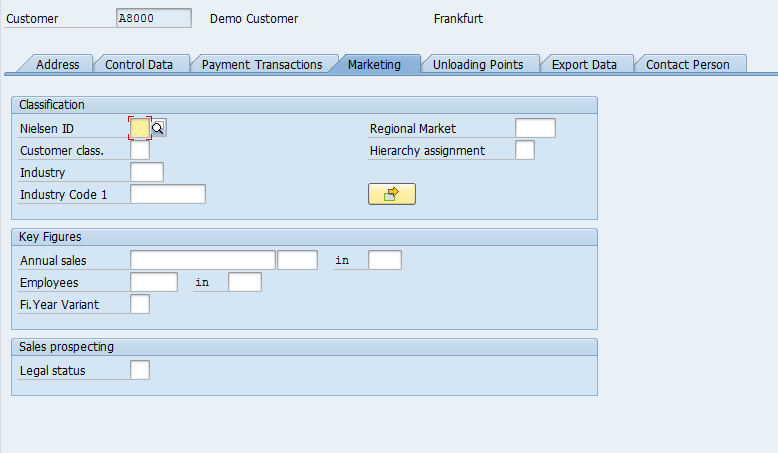 Once you have populated all the required fields, press either enter or at the end of the dialog box. The system will take you the first tab of the General Data where you are required to enter Customer’s basic information, i.e. Address, Telephone Number, Email, etc. Please note the fields having a check box are required fields. If they are not populated, the system will prompt with an error message . Scroll to other Tabs in General Data and populate data where required. If your Customer is also your Vendor, you can enter the Vendor number of Vendor Master in the Vendor field. Press button to enter the Company Code Data view. 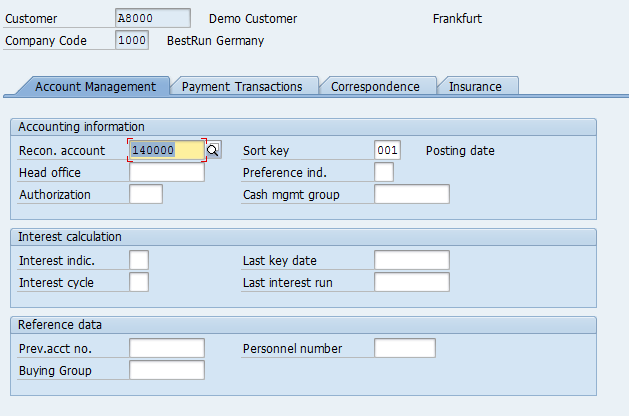 Since this Customer is created with reference, hence, fields of Reconciliation Account and Sort Key are already populated. 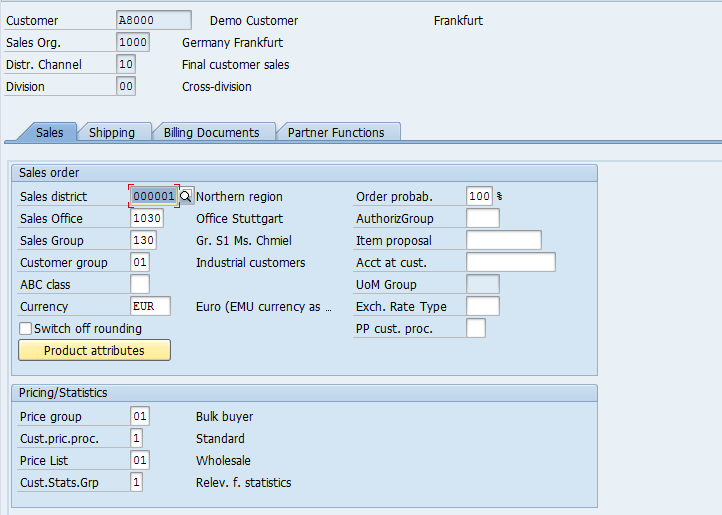 Press button to enter the Sales & Distribution data view. The first tab you will arrive is ‘Sales’. It contains sales related information. Sales District – A geographical segmentation which defines a higher level of sales geographical structure. Sales Office – Sales Office establishes connection between the company and the customer. It monitors company’s sales in the market which is done by company’s sales force. It is a physical location that has the responsibility of the sale of certain products or services within a given geographical area. Sales Group – A sales office can be sub divided into sales groups. 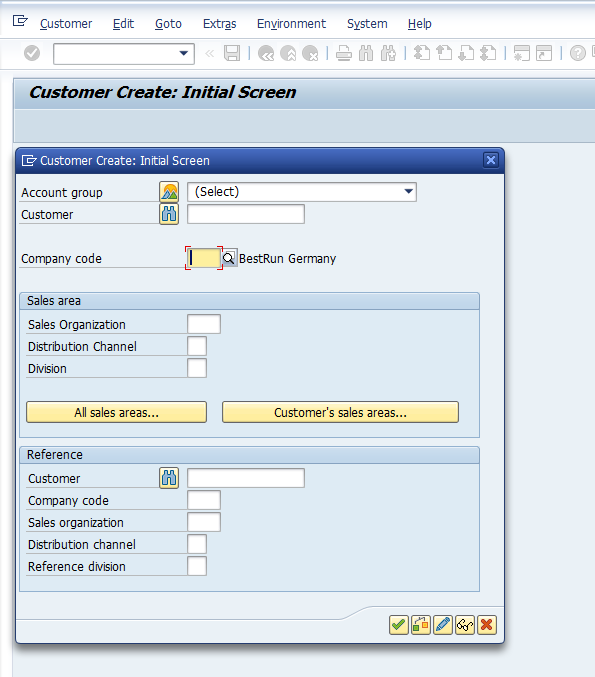 Customer Group – Identifies a group of customers (for example, wholesale or retail). Currency – the currency in which the customer order goods. Acct at cust. – Your Vendor or account number which the Customer uses in their organization for various purposes. Price group – which pricing group does the customer belongs, for pricing condition purposes. Cust.pric.proc. – for determination of correct pricing structure on Sales Order. Price List – the pricing classification to which the customer belongs. Cust.Stats.Grp – for generating SIS (LIS) reporting. The second tab is of ‘Shipping’ which is relevant at the time of delivery / dispatch or shipment of goods to the Customer. Delivery Priority – High, Normal, Low, Medium. Shipping Conditions – Standard or Immediately. Delivering Plant – Plant from which the goods to be dispatched to the Customer. Complete Delivery – if the Customer only accepts complete deliveries and partial is not allowed. This check box needs to be checked if Customer doesn’t accept partial deliveries. Partial delivery per item – whether partial deliveries are allowed. Max. partial deliveries – the number of maximum partial deliveries are allowed. Unlimited tol. – if the customer accepts unlimited over or under deliveries of goods ordered. Underdel. Tolerance – Percentage (based on the order quantity) up to which an under delivery is accepted by the Customer. Overdeliv. Tolerance – Percentage (based on the order quantity) up to which an over delivery is accepted by the Customer. It contains information whether the Customer is relevant for Rebates. Terms of payment – agreed terms of payment with the Customer weather is Customer is a Cash or Credit. Paym.guar.proc. – Payment Guarantee Procedure defines if the Customer pays via Letter of Credit, Payment Cards or Bank Guarantee. Credit ctrl area – Credit Control Area, if the Customer is a Credit Customer and belongs to a Credit Control Area. Taxes – if the customer is liable for Taxes or exempted etc. If the Customer has multiple locations where he ordered the goods to be delivered, you can add Ship to Parties here in this tab. Please note that the Ship to Party Master Data should be created under relevant Account Group. 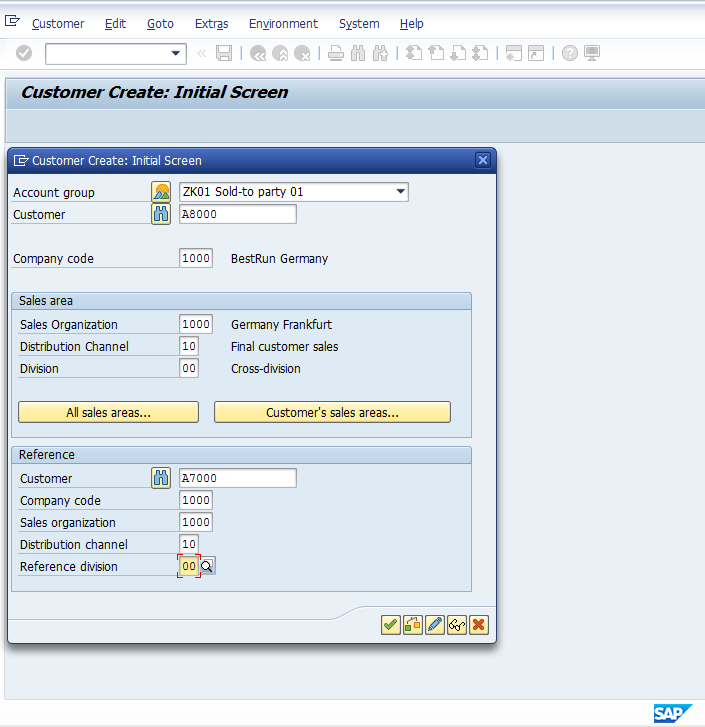 Once you are done with maintaining and changing values in the SAP Customer Master Data, don’t forget to press Save or CTRL+S for the values to take effect in your sales transactions and the system will confirm that the Customer is created and saved. Yes, thank you for spotting this typo! But in this Lesson, XD01 is mentioned as “Create Customer Master – Centrally / Complete”. XD01 is for customer master. Thanks for pointing our this typo! Can you help me define Sold-To party, Ship-To party and Bill-To party? We use all three! I am trying to write work instructions but am not entirely clear as to why we use all of them and have no point of reference as this was set up as part of our implementation. It would be good to include a small point/section mentioning how to extend the existing customers across sales area or extending a Sold to as Ship to or Bill to etc.